I've done some research and some thinking on our perennial Koko Crater troubles. We love to launch and fly there on the handful of days a year when we have moderate southeasterly winds. 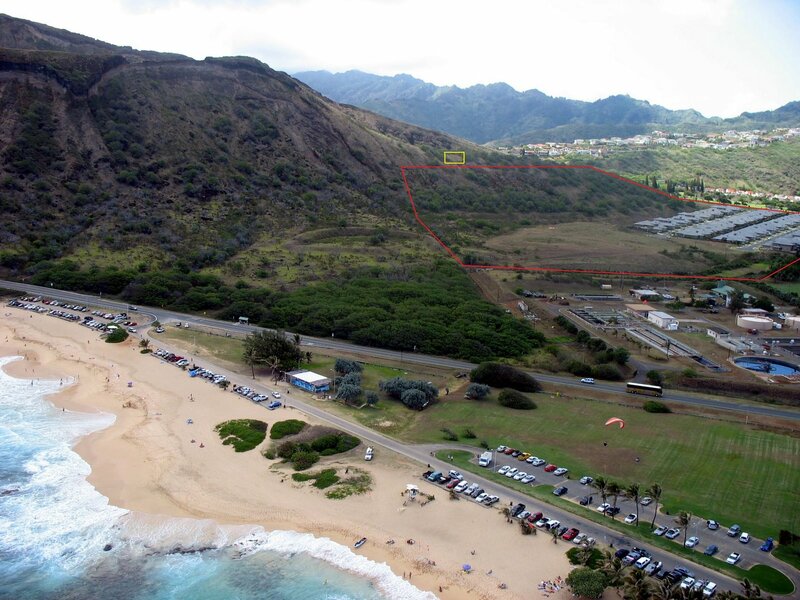 It's great to have the largest grassy landing zone on the island just across the highway at Sandys. It's a backyard flying site for Dave and Bob who live right there in Kalama Valley, and also for Frank who lives right behind in Hawaii Kai. Originally Doug and other old timers used to hike up the blowhole side and launch facing south. We've been flying there more often since Troy pioneered the lower launches that face southeast. 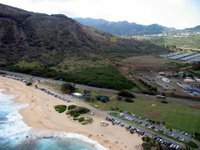 He considered it a good alternative to Nanakuli, a short hike on the east side of the island to access the strong thermals that detonate there on very light southeasterly days. But actually most of us tend to fly there in a bit more wind, when there's some sustaining ridge lift. One winter we flew there almost every day for a month, when the wind was stuck coming from the southeast for some reason. After a while, the stables complained about us spooking their horses during lessons, and they called the police a few times. Since then we've made an effort to avoid flying low over the launch ridge above their viewplane. Another time we had a group of visiting pilots who decided to hike up the southwest facing side and soar there on a day when the winds were blowing from that direction, and as a result the police closed the firing range located below that side, and then met the pilots after they landed at Sandys to make it clear that they do not want gliders soaring there. When the developers cleared the flat portion below the ridge, we appreciated the new easily accessible emergency bomb-out landing zone. But our use of that parcel has generated a variety of complaints from the developers and residents over the years. Every winter season we have occasional conversations with residents, security guards and police about landing down below. 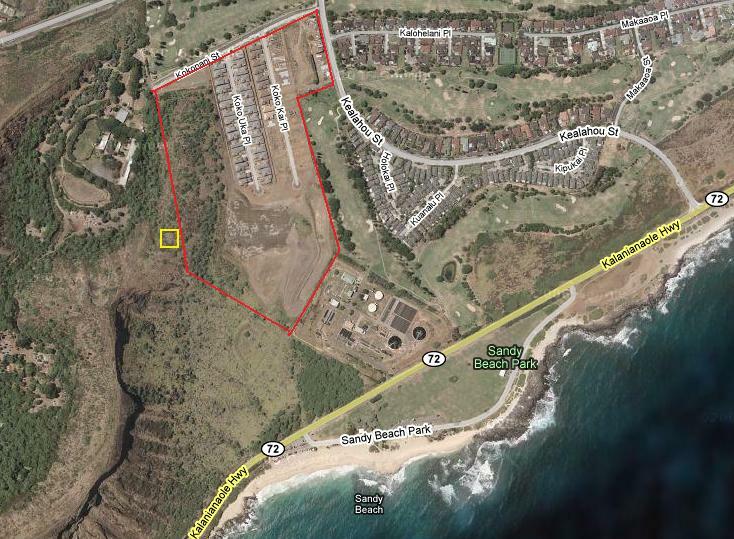 I looked it up, and found out that the land parcel owned by the developer at Koko Crater is huge. It extends from the end of the road at the driveway of the stables up and over the low ridgeline, to a point just below and makai of our low launch spot, and then down to the corner of the sewage treatment plant. That means the developer owns the trailhead and the lower portion of the ridge, in addition to the vast flat portion below. The undeveloped portion is fenced off from the residential neighborhood, and is posted with warning signs to keep people out. The rest of the crater, including the interior (where the botanical gardens and stables are located), and the flat portion that extends towards Sandys, belongs to the City and County. The developer recently gave up on an effort to rezone and develop the small chunk of property at the northeast corner of the parcel, according to this Advertiser article. As far as we know they have no immediate plans to develop any of the rest of the parcel, although I've heard rumors about possible future housing there from some residents. 1. Let's avoid launching there when the conditions are marginally light or cross. 2. If we do find ourselves getting low, let's pick a clearing as close as possible to the Sandys side, and then walk from there out to the park. 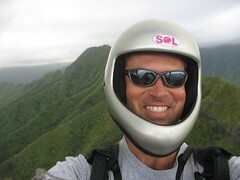 Many pilots have pioneered that route over the years as a direct return trip to Sandys. I've done it a few times - the trick is to find a route that's not totally overgrown with man-eating weeds and filled with hidden obstacles like old rusting cars. 3. Let's not drive or walk through the neighborhood, or along the backyard fenceline, and let's not climb over the fences there. When these nice folks bought their million dollar dream homes crammed like sardines around a bone dry dead end street just behind a smelly sewage plant, they weren't expecting to have to share their little corner of paradise with nutty free spirits like us. They value their privacy just like any homeowner would. Let's respect that and give their beautiful neighborhood a wide berth on the handful of flyable days that we're out there. Let me know if you guys think this approach is worth pursuing. It seems to me like the easiest and most likely way to avoid further complications out there. Let's do whatever we can to keep the remainder of our winter season hassle-free at Koko Crater. See you out there. Thanks Alex for delineating where the boundry is. That leaves plenty of real estate to bomb out on especially from hi launch. May take a little LZ prep, maybe that manini crater - easy walk out adjacent to the bus stop. Now we just have to figure out how to get to launch from the bus stop. Where is the trail head for the blow-hole side? The trailhead for the blowhole side is right across from the blowhole. We tried that hike and launch again recently for old times sake, and found the hike up that side to be incredibly steep, just like I remembered it. Scrappy had a severe hangover and almost had to be airlifted out halfway. I've hiked and launched that side 2 or 3 times when the conditions were more southerly, but I've never managed to get up from there - it's always been too light. I like your ideas, Alex! Reaper always told us; "You can Always make the sandys LZ on direct glide from high launch - even in 0 wind!" We'd always take that right turn, however to see if we could create something out of nothing! If you know your gonna bomb out, just bee-line it straight for the LZ-Forget that forbidden zone; You might just catch that lucky thermal, proving yourself wrong & have an unexpectedly nice flight.